The flu is an infection of the nose, throat, and lungs. It spreads easily. This article discusses influenza types A and B. Another type of the flu is the swine flu (H1N1). Most people get the flu when they breathe in tiny airborne droplets from the coughs or sneezes of someone who has the flu. You can also catch the flu if you touch something with the virus on it, and then touch your mouth, nose, or eyes. People often confuse colds and flu. They are different, but you might have some of the same symptoms. Most people get a cold several times a year. On the contrary, people get the flu only once every few years. Sometimes, you can get a virus that makes you throw up or have diarrhea. Some people call this the "stomach flu." This is a misleading name because this virus is not the actual flu. The flu mostly affects your nose, throat, and lungs. Flu symptoms will often start quickly. You can start to feel sick about 1 to 7 days after you come in contact with the virus. Most of the time symptoms appear within 2 to 3 days. The flu spreads easily. It can affect a large group of people in a very short amount of time. For example, students and co-workers get sick within 2 or 3 weeks of the flu's arrival in a school or workplace. The first symptom is a fever between 102°F (39°C) and 106°F (41°C). An adult often has a lower fever than a child. Most symptoms go away in 4 to 7 days. The cough and tired feeling may last for weeks. Sometimes, the fever comes back. Some people may not feel like eating. The flu can make asthma, breathing problems, and other long-term (chronic) illnesses and conditions worse. Most people do not need to see a health care provider when they have flu symptoms. This is because most people are not at risk for a severe case of the flu. If you are very sick with the flu, you may want to see your provider. People who are at high risk for flu complications may also want to see a provider if they get the flu. When many people in an area have flu, a provider can make a diagnosis after hearing about your symptoms. No further testing is needed. There is a test to detect the flu. 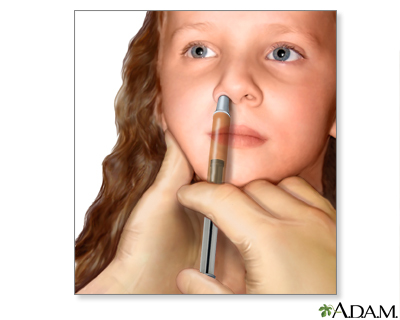 It is done by swabbing the nose or throat. Most of the time, test results are available very fast. The test can help your provider prescribe the best treatment. Acetaminophen (Tylenol) and ibuprofen (Advil, Motrin) help lower fever. Providers sometimes suggest you to use both types of medicine. DO NOT use aspirin. A fever does not need to come all the way down to normal. Most people feel better when the temperature drops by 1 degree. Over-the-counter cold medicines may make some of your symptoms better. Cough drops or throat sprays will help with your sore throat. You will need a lot of rest. Drink plenty of liquids. DO NOT smoke or drink alcohol. Most people with milder symptoms feel better in 3 to 4 days. They do not need to see a provider or take antiviral medicines. These medicines may shorten the time you have symptoms by about 1 day. They work better if you start taking them within 2 days of your first symptoms. Children at risk of a severe case of the flu may also need these medicines. Millions of people in the United States get the flu each year. Most people get better within a week or two, but thousands of people with the flu develop pneumonia or a brain infection. They need to stay in the hospital. About 36,000 people in the United States die each year of problems from the flu. Call your provider if you get the flu and think you are at risk for having complications. Also, call your provider if your flu symptoms are very bad and self-treatment is not working. You can take steps to avoid catching or spreading the flu. The best step is to get a flu vaccine. Stay in your apartment, dorm room, or home for at least 24 hours after your fever has gone. Wear a mask if you leave your room. Avoid sharing food, utensils, cups, or bottles. Use hand sanitizer often during the day and always after touching your face. Cover your mouth with a tissue when coughing and throw it away after use. Cough into your sleeve if a tissue is not available. Avoid touching your eyes, nose, and mouth. The Centers for Disease Control and Prevention (CDC) recommends that everyone 6 months and older should receive the influenza vaccine. For the 2018-2019 season, the CDC recommends use of the flu shot (inactivated influenza vaccine or IIV) and the recombinant influenza vaccine (RIV). The nasal spray flu vaccine (live attenuated influenza vaccine, or LAIV) may be given to healthy, non-pregnant people 2 through 49 years of age. Centers for Disease Control and Prevention website. Inactivated influenza VIS. www.cdc.gov/vaccines/hcp/vis/vis-statements/flu.html. Updated July 11, 2018. Accessed October 9, 2018. Centers for Disease Control and Prevention website. Live, intranasal influenza VIS. www.cdc.gov/vaccines/hcp/vis/vis-statements/flulive.html. Updated July 11, 2018. Accessed October 9, 2018. Centers for Disease Control and Prevention website. What you should know about flu antiviral drugs. www.cdc.gov/flu/antivirals/whatyoushould.htm. Updated June 20, 2018. Accessed October 9, 2018. Ison MG, Hayden FG. Antiviral agents against respiratory viruses. In: Cohen J, Powderly WG, Opal SM, eds. Infectious Diseases. 4th ed. Philadelphia, PA: Elsevier; 2017:chap 154. Linda J. Vorvick, MD, Clinical Associate Professor, Department of Family Medicine, UW Medicine, School of Medicine, University of Washington, Seattle, WA. Also reviewed by David Zieve, MD, MHA, Medical Director, Brenda Conaway, Editorial Director, and the A.D.A.M. Editorial team. Editorial update 10/08/2018.